Last night I had a dream where it felt like I was in a silent movie. No words are spoken. Everything is communicated in silence. My friend Dinah is sharing my house with me and has rented one of the rooms. She has a guest, a man she is interested in who comes to visit. I examine the locks on the door to ensure she is safe. It feels like the world is shifting and changing. I now find myself seating in church pews. There is a canopy above my head which I secure in front and behind me. I am now aware of Nuns who are seated in front of me. They in turn take the canopy and extend it to the pews in front of them. There are now Nuns seated in front of them. They too take the canopy and extend it to the seats in front of them. This goes on several times maybe 5 – 7 times such that it now feels like I’m riding in a bus. The world is shifting around us except under this canopy. It feels like we too are moving but we are moving as a collective. 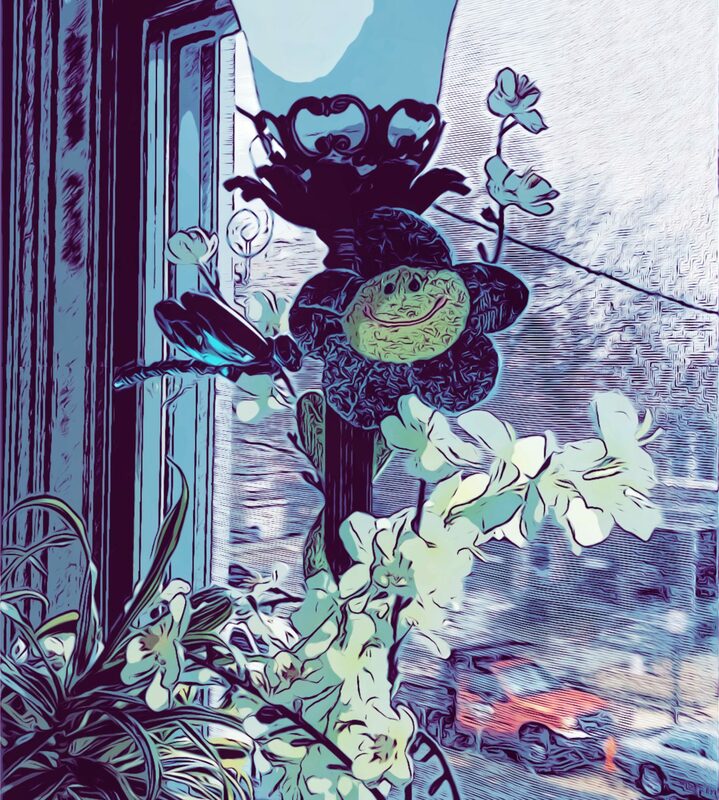 A faerie is seated beside me to my right and below my under arm. He hands me Moose antlers with the understanding that I am to use them for flight. I’m a bit confused as I am unsure how I am to use them for this purpose. Do I put them on my head or to I extend my arms? I extend my had to accept the antlers from the faerie. As soon as I do their power pulses through my body. As I sat here trying to remember my dream to journal it. I thought about what the name would be and what image could possibly go with it. 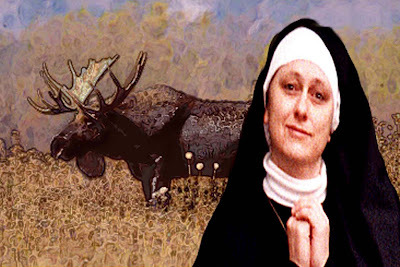 I wanted to use both the Nun and the Moose in the title but how in the world was I going to find an image. Well it appears an artist Alanna Wood has created a work of art that depicts just that? As I clicked through to the larger image I was drawn to the way the grass is depicted in the image the texture reminded me of the canopy in my dream. The antlers were very similar. I also found another picture with nun holding deer antlers but the antlers didn’t match my dream. Very interesting similarities. They are symbolic of bravery and dominance. Antlers are a moose’s greatest system of defense. They also come in handy to get the ladies. To explain…during mating season (in the Fall), male moose vie for the attention of the cows (female moose). I had a dream where I return to a resort where I’ve stayed before. A part of me believes I should have a my room reserved at this location. I find my room close to the pool and walk in. The room has changed. They have made it more agreeable and amenable for more people to stay with me. There are two rooms with beds in them and one room even has bunk beds. It looks more generic than personalized but I do like the layout. Considering this is a vacation space I think the layout works nicely. I look for the bathroom and notice the door is closed. I can hear someone inside using it. Knowing I have to go to the bathroom I remember there being a restroom on the other end of the resort. I recall something new about the resort. I recall the entire resort being available for my needs. I recall not only additional restrooms available but additional sleeping areas. The choice is mine to make. I walk out the door toward the pool on route to the other restroom. There are people in the pool. One woman is completely naked. She walks on water. She is walking toward another woman who is in the pool leaning against the pools inner wall. Although she is a woman she has both male and female attributes. The woman who walks on water, walks on the surface of the water toward the other woman. Before arriving in front of her she goes under the water and fondles the other woman’s private masculine parts. I’m surprised at their open display of affection. I wish I had time to be as free to enjoy that type of intimacy but I have to find a restroom. I finally couldn’t wait any longer and woke up to go to the real world bathroom. I did my business and returned to bed. I quickly returned to the dream. I am now entering the other bathroom where a man stands. He is an Amish man with a full beard with a soft breathable cotton shirt, leather suspenders and a relaxed look. He wears a suede leather Amish style hat. He sees me enter the restroom and salutes me by taking off his hat. Except under the hat he has another hat. He then proceeds to take the second hat off only to discover under that hat he has yet another hat. This continues for about 5 hats. The last hat on his head is small with a 5 inch brim and is tied under his neck. Atop the crown of the hat are two small Moose with full antlers. It feels like a magic trick as the outcome is completely unexpected. Like a child amused with laughter we both laugh with full bellied joy. It becomes apparent he is doing this to amuse me. His interest in pleasing me touches my heart and soul.